Sauve Nollywood actor, Yemi Olatunji, better known as Yemi Blaq, is not known for scandals, but for his good acting prowess, which has made him one of the most talented and professional actors the film industry can boast of. Yemi Blaq is a complete actor that can also act on stage, which some of Nigeria's popular actors can't dare to do. His family life has not been in the news, but recently, the 'Segun Arinze's brother' gave his fans something about his his lovely family comprising of his wife, Remi and son, who is about two years old. 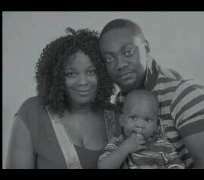 No doubt, Yemi Blaq is enjoying his marriage to Remi and is proud of his family.